I made this Blue Apron meal for dinner Friday night. We really liked it. My advice on this recipe is to squeeze the grated cucumber before making the yogurt sauce (tzatziki). Also, instead of mincing and smashing to make a garlic paste – definitely invest in a microplane or zester and use that, you will love it! There is no point in quartering the lemon, like the recipe says, just halve it since you are using half in one step and half in the other. Lastly, if you love garlic like I do, use 2 cloves for this recipe, one for the yogurt sauce, and one for the tabbouleh. And if you like spicy, top with some hot sauce, I used Franks Extra hot. Heat a small pot of salted water to boiling on high. Once boiling, add the bulgurand cook 12 to 14 minutes, or until tender. 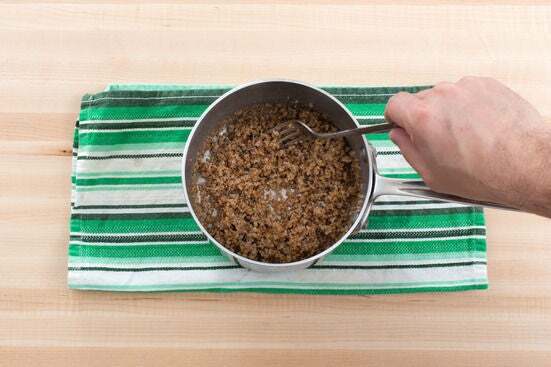 Drain the cooked bulgur thoroughly and return to the pot. While the bulgur cooks, wash and dry the fresh produce. Quarter the tomatoes. Pick the mint leaves off the stems; discard the stems. Peel and mince the garlic; smash with the flat side of your knife until it resembles a paste (or use a zester). 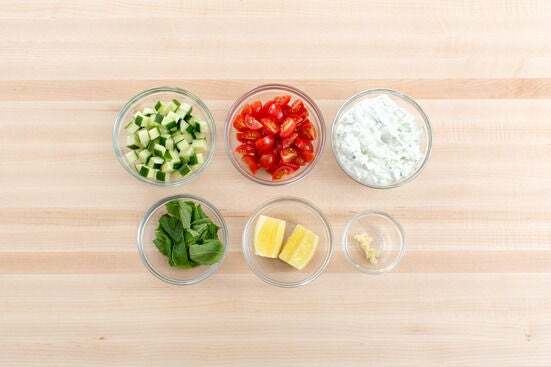 Halve the cucumber crosswise; medium dice 1 half and grate the remaining half. Quarter and deseed the lemon. In a medium bowl, combine the yogurt, grated cucumber, half the garlic paste and the juice of 2 lemon wedges; season with salt and pepper to taste. Pat the chicken dry with paper towels; season with the ras el hanout, salt and pepper on both sides. In a large pan, heat 2 teaspoons of olive oil on medium-high until hot. 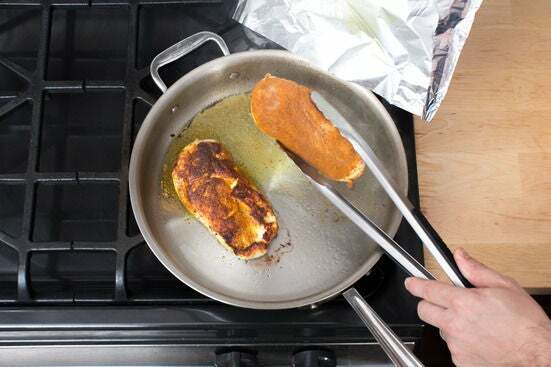 Add the seasoned chicken and cook, loosely covering the pan with aluminum foil, 3 to 5 minutes per side, or until browned and cooked through. Transfer to a cutting board and set aside to cool slightly. 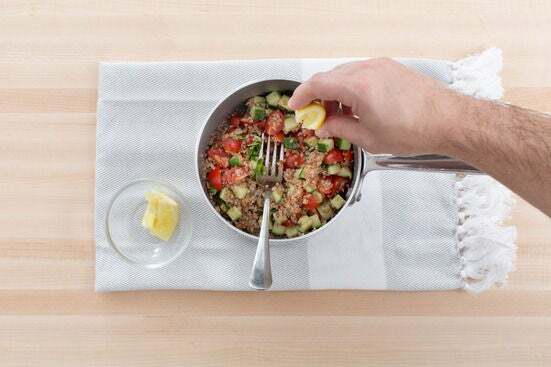 While the chicken cooks, to the pot of cooked bulgur, add the tomatoes, diced cucumber, half the mint (tearing the leaves just before adding), remaining garlic paste and the juice of the remaining lemon wedges. Drizzle with olive oil and stir to thoroughly combine. In the pan used to cook the chicken, heat 2 teaspoons of olive oil on medium until hot. Working 1 at a time if necessary, add the pitas and cook 30 to 45 seconds per side, or until warmed through and pliable. 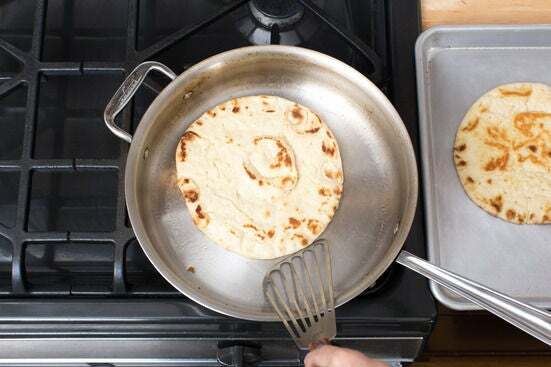 Transfer the warmed pitas to 2 plates. When cool enough to handle, thinly slice the cooked chicken on an angle. 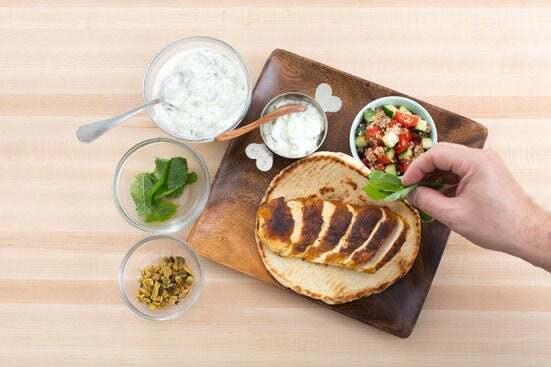 Spread a layer of the yogurt sauce into each warmed pita (you will have extra). Divide the sliced chicken between the warmed pitas. Top with the remaining mint and pistachios. 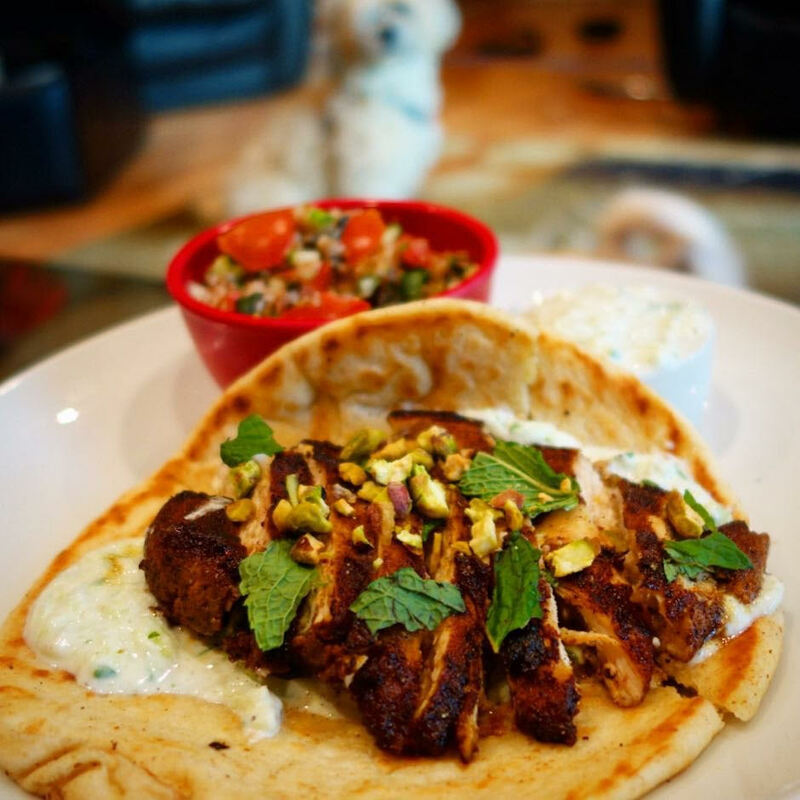 Serve with the tabbouleh and remaining yogurt sauce on the side. Enjoy!